If there’s one thing every parent has in common, aside from keeping you child alive of course, is the daily task of keeping those little energetic sprogs entertained each and every day. We’re constantly torn between visiting yet another play park or gearing up the energy to do something as adventurous as swimming or soft play, and if you’re feeling particularly brave, baking cakes or finger painting- Eek! It’s an endless but inevitable part of parenting and when you’re dealing with tiny humans with short attention spans it can all get a little bit exhausting, especially when, some days all you want to do is stay at home and hang out with your little pickles. Which is why I’m always up for trying out new toys and gadgets in the hope that we can enjoy more mornings or afternoons at home. More so now than ever as my pregnant trotters are starting to swell and all I really want to do is have five minutes peace to drink a hot cup of tea and put my feet up. 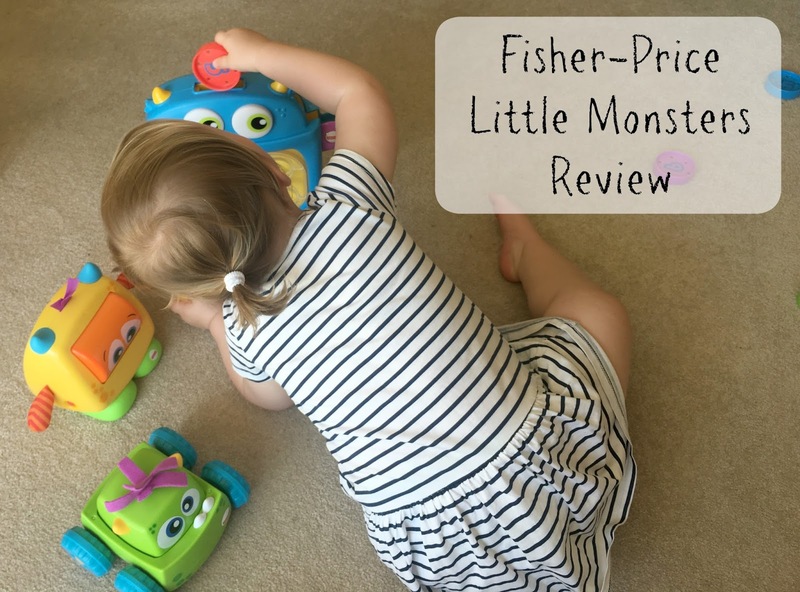 So when Fisher-Price asked us to review their brand new Monsters range, this waddling Mumma of course said yes and ran to put the kettle on. Full of colour, quirkiness and fun these little monsters are designed to introduce your baby to a range of emotions, expressions and feelings as well as developing baby’s senses. The Fun Feelings Monster (£9.99) with it’s bright rolling face which changes emotions from happy, to sad, to surprised. It plays a funny sound to represent each emotion when baby rolls it around. The Hungry Monster Maze (£19.99) includes six colourful discs for baby to slot into the monster’s head and then watch them roll into his belly and down his tail as it makes funny chomping sounds and his eyes light up. 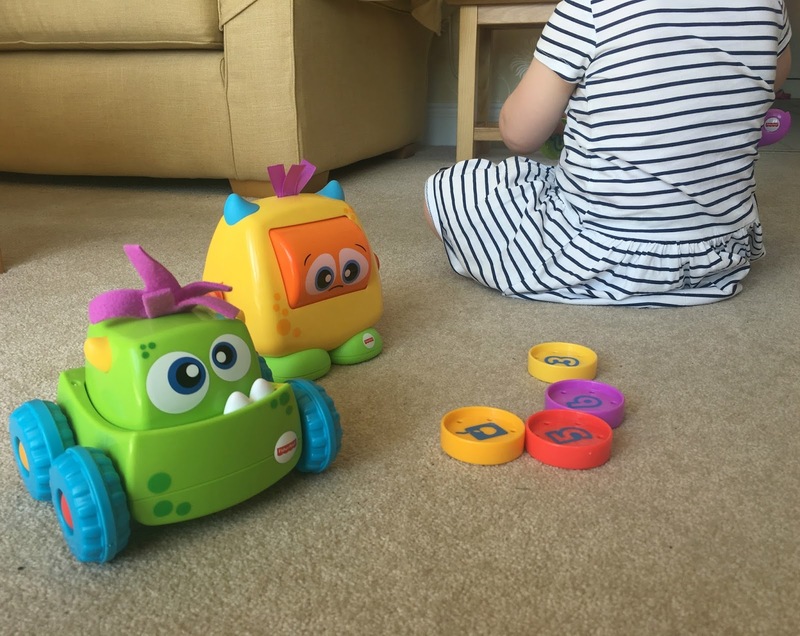 Lastly the Press n’ Go Monster Vehicle (£14.99) will get babies moving as they press down the monster’s funny head and watch it whizz across the floor. Like most baby’s, anything new and colourful is always bound to catch their attention. Our little people want to explore new things, particularly ones that they are allowed to touch so Elsie was thrilled to be handed over three new brightly coloured new contraptions to figure out and enjoy. Her particular favourite is the Hungry Monster Maze. She’s always had pretty good fine motor skills so she loved slotting the discs into the monster’s head with ease, scooping them up from his tail and starting all over again. What surprised me the most about her interaction with the toys was how quickly she figured out how each one worked. I didn’t really have to demonstrate how each Monster worked, which to me was a clear sign that perhaps she was a little too old for this range. She mastered each Monster so quickly that it suddenly dawned on me that our little girl isn’t so little anymore. This isn’t in any way a criticism on the toys themselves as perhaps six months ago Elsie would have been less mobile and would therefore get more enjoyment from each product. I can definitely see how much fun these toys would be to a younger baby, and the guidelines suggest from six months old, so it all depends on each individual baby’s interactive stage. These Monsters would make a great first birthday gift for babies who are needing entertaining at the sitting and crawling stage so I’m definitely looking forward to enjoying these toys again at a later stage with baby number two. They come with batteries. I know I’ve mentioned this before but there really is nothing more frustrating than having to hunt down batteries to make a toy work after you’ve spent a good ten minutes of your life hacking away at the packaging, so this is always a bonus in my book. My initial thoughts were perhaps that they were priced a little high for what they did, but on reflection I was looking at them from the wrong angle. Elsie has moved on so quickly to the next stage of learning and interaction that I hadn’t even realised that we needed to change the way we entertain her. It was fun seeing her explore something new and talking her through all the different types of expressions and emotions which we both enjoyed. 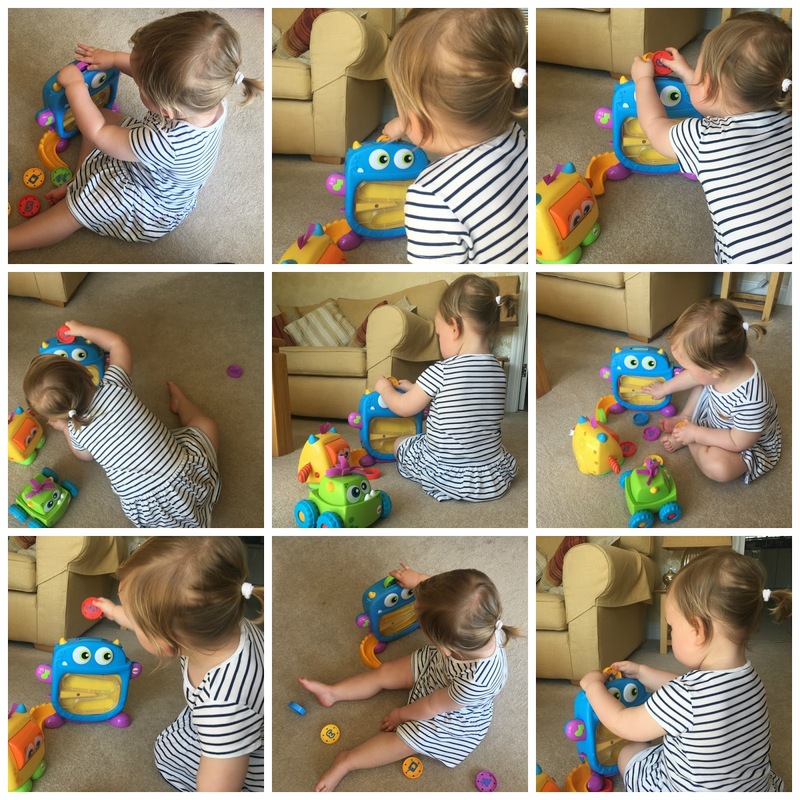 What is lovely is that I could really see her enjoying these particular toys again in a few months time with her brand new sibling showing them how each monster worked and encouraging them to play with her. Disclosure: We were kindly sent the featured products for the purpose of this review. Thank you for supporting the brands that make this blog possible and keep the sprog entertained whilst I enjoy a hot cup of tea.